The Bible is a compilation of many shorter books written at different times by a variety of authors, and later assembled into the biblical canon. All but the shortest of these books have been divided into chapters, generally a page or so in length, since the early 13th century. Since the mid-16th century, each chapter has been further divided into "verses" of a few short lines or sentences. 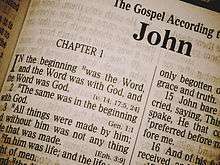 Sometimes a sentence spans more than one verse, as in the case of Ephesians 2:8–9, and sometimes there is more than one sentence in a single verse, as in the case of Genesis 1:2. As the chapter and verse divisions were not part of the original texts, they form part of the paratext of the Bible. The Jewish divisions of the Hebrew text differ at various points from those used by Christians. For instance, in Jewish tradition, the ascriptions to many Psalms are regarded as independent verses or parts of the subsequent verses, making 116 more verses, whereas the established Christian practice is to treat each Psalm ascription as independent and unnumbered. Some chapter divisions also occur in different places, e.g. 1 Chronicles 5:27–41 in Hebrew Bibles is numbered as 1 Chronicles 6:1–15 in Christian translations. While chapter divisions have become nearly universal, editions of the Bible have sometimes been published without them. Such editions, which typically use thematic or literary criteria to divide the biblical books instead, include John Locke's Paraphrase and Notes on the Epistles of St. Paul (1707), Alexander Campbell's The Sacred Writings (1826), Richard Moulton's The Modern Reader's Bible (1907), Ernest Sutherland Bates' The Bible Designed to Be Read as Living Literature (1936), and The Books of the Bible (2007) from the International Bible Society (Biblica). The first person to divide New Testament chapters into verses was Italian Dominican biblical scholar Santi Pagnini (1470–1541), but his system was never widely adopted. His verse divisions in the New Testament were far longer than those known today. Robert Estienne created an alternate numbering in his 1551 edition of the Greek New Testament  which was also used in his 1553 publication of the Bible in French. Estienne's system of division was widely adopted, and it is this system which is found in almost all modern Bibles. Estienne produced a 1555 Vulgate that is the first Bible to include the verse numbers integrated into the text. Before this work, they were printed in the margins. Psalm 117 is the middle chapter of the Bible, being the 595th Chapter. Psalm 117 is also the shortest chapter of the Bible. 1 Chronicles 1:25 ("Eber, Peleg, Reu") is the shortest verse in the Old Testament. ↑ Ernst Würthwein, The Text of the Old Testament (Grand Rapids: Eerdmans, 1998), p. 20. 1 2 Würthwein, The Text of the Old Testament, n. 28. ↑ Kurt and Barbara Aland, The Text of the New Testament (Grand Rapids: Eerdmans and Leiden: E.J. Brill, 1989), pp. 252 ff. ↑ Consortium, Europeana Regia. "Europeana Regia - Paris Bibliothèque nationale de France MSS Latin 3". ↑ Hebrew Bible article in the Catholic Encyclopedia. ↑ Bruce M. Metzger, The early versions of the New Testament: Their origin, transmission and limitations, Oxford University Press (1977), p.347. Cited in Stephen Langton and the modern chapter divisions of the bible by British translator Roger Pearse, 21 June 2013. ↑ Miller, Stephen M.; Huber, Robert V. (2004). The Bible: A History. Good Books. p. 173. ISBN 1-56148-414-8. 1 2 "Pitts Theology Library Exhibit on the Verses of the New Testament". ↑ "Chapters and Verses: Who Needs Them?," Christopher R. Smith, Bible Study Magazine (July–Aug 2009): 46–47. ↑ Zylstra, Sarah Eekhof (25 July 2014). "Introducing the Bible! Now with Less!". Christianity Today. Retrieved 23 August 2014.